I’ve smoked well over a hundred thousand cigarettes in my life and each one of those cigarettes meant something to me. I even enjoyed a few of them. I’ve smoked OK, great and terrible cigarettes; I’ve smoked dry and moist, aromatic and almost sweet cigarettes. I’ve smoked hastily, and other times slowly and with pleasure. I’ve scrounged, stolen and smuggled cigarettes, I’ve obtained them by devious means and I’ve begged for them. I once paid thirteen dollars for a pack at a New York airport. I’ve thrown out half-full packs only to fish them back out of the rubbish to render them useless once and for all under the tap. I’ve smoked cold cigarette butts, cigars, cigarillos, bidis, kreteks, spliffs and straw. I’ve missed flights because of cigarettes and burnt holes in trousers and car seats. I’ve singed my eyelashes and eyebrows, fallen asleep while smoking and dreamt of cigarettes – of relapses and flames and bitter withdrawal. I’ve smoked in over 45 degree heat and in minus 25 cold, in libraries and seminar rooms, on ships and mountain tops, on the steps of Aztec pyramids, furtively in an old observatory, in basements and barns and beds and swimming pools, on air mattresses and in thin-hulled rubber dinghies, on the prime meridian in Greenwich and the 180th meridian in Fiji. I’ve smoked because I was full and I’ve smoked because I was hungry. I’ve smoked because I was glad and I’ve smoked because I was depressed. I’ve smoked out of loneliness and out of friendship, out of fear and out of exuberance. Every cigarette that I’ve ever smoked served a purpose – they were a signal, medication, a stimulant or a sedative, they were a plaything, an accessory, a fetish object, something to help pass the time, a memory aid, a communication tool or an object of meditation. Sometimes they were all of these things at once. I no longer smoke, but there arestill moments when I can think of nothing but cigarettes. This is one of those moments. I really shouldn’t be writing this book. It’s too much of a risk. But I won’t be deterred. I will write about it all, without mystifying or demonising it. I regret nothing. Every cigarette I’ve ever smoked was a good cigarette. There are people I’d really like to smoke a cigarette with: friends I haven’t seen for a long time, artists I admire. That this won’t come to pass isn’t solely down to me and my resolution. Most of them don’t smoke anymore. Some of them are already dead. I’d have liked to have smoked with my grandfather, whose huge, calloused hands always made the cigarette look so thin and fragile. He died too soon. I’m convinced that he died because his cigarettes were taken away from him when he was admitted to hospital after a fall, even if he only smoked five to ten a day for sixty years. My grandfather was an extremely restrained man. When, on occasion, he spent the whole morning sitting in his kitchen in Koblenz-Pfaffendorf sorting lentils or peeling potatoes or polishing eggs dyed bright colours for Easter on a laid out newspaper with a piece of bacon rind to stop them going bad, the pack of Lux with the matchbook hidden inside lay beside him like a promise. I often dreamt of smoking in an art museum. I imagined how I would sit on one of those smooth, solid wood benches already warmed by the obliquely angled afternoon sun in front of a quickly painted and austere group portrait by Frans Hals, for instance, and light up a Finas Kyriazi Frères, a filterless oriental cigarette that sadly vanished from the market a few years ago. I’ve no doubt that this would be a moment of absolute clarity, perhaps my greatest moment of happiness.This will never happen. I no longer smoke. But I can write about it. And as I circle the subject of my addiction – a central theme in my life – through writing, I might as well ask myself a few questions: How did I become a smoker? What was it that I needed? Did the countless cigarettes I smoked throughout the course of my life satisfy this need? How did I deal with my addiction alongside the occasional fear of not being able to control it? Was I not afraid of the risks? There’s no need for me to set out my reasons for quitting. Everyone knows the arguments, the social and the medical. Smoking is a compulsive behaviour. He who conquers his urges gains his freedom. I’ve failed often enough to know that I’m right at the beginning. I’ve decided that this time I’ll write my way out of my addiction by telling its story. I’m devoting my undivided attention to a structure that governed nearly my entire life and that at certain times I actually mistook for being life. I took many of my patterns of behaviour, automatisms and thought processes for granted, I never even noticed them. It’s only now in retrospect that I can engage with them and begin to make sense of them. Something staggering occurs to me: I’ve smoked over a hundred thousand cigarettes and with the best of intentions cannot say whether the paper crackles when you light one like in the old cinema adverts. I’ve never noticed, not once. 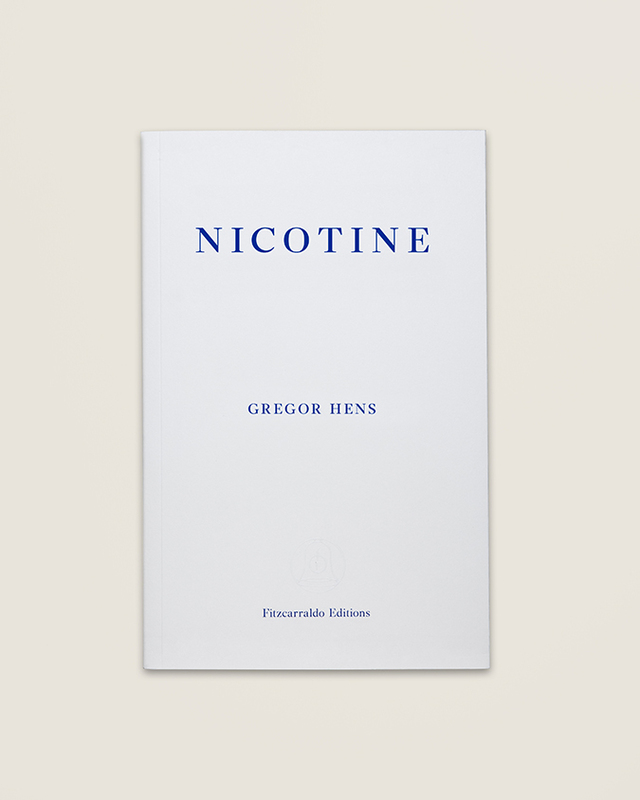 Gregor Hens, born in 1965, is a German writer and translator. He has notably translated Will Self, Jonathan Lethem and George Packer into German. Jen Calleja is a writer, translator, curator and musician. She has translated prose and poetry for Bloomsbury, PEN International, the Austrian Cultural Forum London and the Goethe-Institut.